Getting to the quarterback has always been what he's done best, and the Longhorns are hoping he continues his rise. Omenihu was a two-time all-district selection in his varsity career at Rowlett. The three-star recruit participated in the 2015 Semper Fidelis All-American Bowl and was a first-team all-district selection as a senior after racking up 61 tackles, including 23 for loss, and 11.5 sacks. He also forced five fumbles. He was a second-team all-district selection as a junior after finishing the year with 50 tackles, four sacks and a forced fumble. Omenihu was a reserve defensive end as a freshman, finishing the 2015 season with 17 tackles, a forced fumbled and a recovered fumble. He made his way into the starting lineup as a sophomore, ending the year with 26 tackles and 3.5 sacks. He started seven of 12 games, but his production and time on the field decreased as the season progressed. The switch to an odd-man front reliant on big, athletic defensive ends under new defensive coordinator Todd Orlando before the 2017 season rejuvenated Omenihu’s career. He started every game except Baylor. He recorded 28 tackles and four sacks, while occupying blocks to allow linebackers like Malik Jefferson and Gary Johnson to run free and make plays. Omenihu flirted with the NFL this past offseason. But he elected to return to Texas since “I know how much more I can develop both as a player and as a leader.” A standout senior season could be beneficial for both Texas and Omenihu — Texas hasn’t had a defensive end taken in the NFL draft since Lamarr Houston in 2010. Last year, Omenihu sacked two of the 2018 draft’s top three picks (Oklahoma’s Baker Mayfield, USC’s Sam Darnold). He also took down Drew Lock, who passed for 3,900 yards last year, in the Texas Bowl. 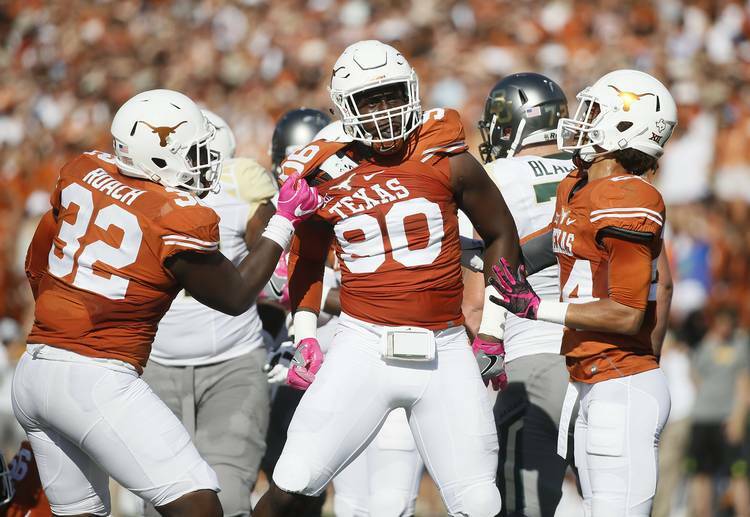 Longhorns defensive backs haven’t shied away from crediting the linemen with pressuring teams into turnovers, so Omenihu and his fellow linemen will need to continue applying heat in a pass-happy conference that’s suddenly lacking in quarterback star power.